The Wheals are a no-frills rock and roll band, based right here in Pittsburgh. They incorporate elements of reggae, gospel, folk, and country to create a unique, mature sound. They'll be bringing that sound to Club Cafe on Saturday, when they'll be playing an acoustic set. Earlier in the day on Saturday, the group will be featured on The Saturday Light Brigade, a radio show broadcast from the Children's Museum of Pittsburgh that focuses on children and families. 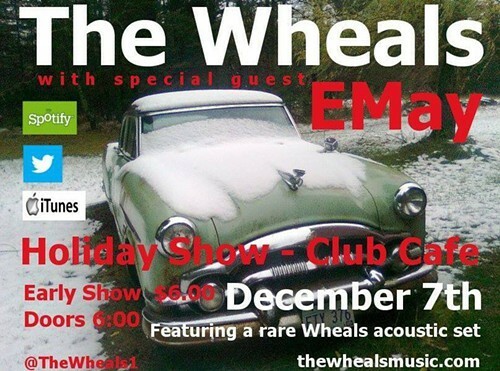 For the Club Cafe show, the Wheals will be joined by special guest EMay. Erika May — better known as EMay — is a folk singer songwriter who is well known around the city for her work with the Saturday Light Brigade and Steel Town Fire. Doors for the concert open at 6 p.m. and there's a $6 cover.